Summer may be winding down, but there’s still time to take the family on a last-minute vacation before school starts. If you’re planning a trip, you probably already have a pre-vacation checklist, but you may have forgotten to include some important plumbing to-dos. Here are just a few things you can do before you head out to avoid a plumbing catastrophe and save on your utilities while you’re away. 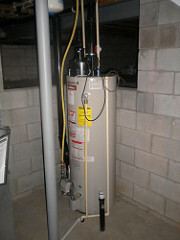 If you have a conventional water heater with a storage tank, it is likely one of the biggest energy consuming appliances in your entire home. If you’re going away for a few days and the temperatures are not expected to drop below freezing, turning of the heater could lead to significant savings on your next gas or electric bill. Plumbing leaks can lead to huge expenses and cause significant property damage. If you are away when a leak occurs, you could come home to a serious disaster. Completely turning off the water supply to your home eliminates the chance of a leak while you’re away. In most homes, the main shut-off valve is located near the water meter. You might have a handle or a hand-crank knob. If you’re having trouble finding your shut-off valve, contact a licensed plumber or assistance. If you are unable to turn off your main water supply because you have a sprinkler system or another plumbing system that needs to remain on, you can still prevent isolated leaks by turning of individual valves. If you have valves on the lines leading to appliances, sinks and toilets, turn them off before you leave. Give yourself some peace of mind while you’re away by taking care of the simple tasks listed above before heading out for your destination. If you need help from a plumber before or after your vacation, Larry & Sons is always available to help. For a Hagerstown plumber you can depend on, contact us today.